Could this be the best way to tackle climate change? Most of the discussions on solutions to climate change are too centred on renewable energy and electric vehicles. That is why Paul Hawken in his recent book Drawdown: The Most Comprehensive Plan Ever Proposed To Reverse Global Warming measured and published the top 100 solutions to climate change. Hawken’s result was indeed surprising. He showed that switching to renewables is just one among many, many equally effective actions. Furthermore, he gave ‘regular people’ a more nuanced understanding of what they can do for the climate. One drawback of his study is the lack of consideration of the financial sector and the flows of capital. In fact, according to our calculations, if Hawken had included sustainable savings in his study it would have come out as the number one solution to combating climate change. As individuals, our ability to steer our pensions and savings is a powerful way of solving the puzzle. It’s a solution with a staggering impact. This is why we want to call Hawken’s study the “almost” comprehensive plan to reverse global warming. So why was this solution left out? I suspect it was for two reasons. First, because for most people it’s still intangible and not well understood. Secondly, because calculations needed to measure the impact of this solution are not easy to come by. So, allow me to give you an introduction to the flows of capital and the climate solution embedded in the financial sector. The total assets under management (“AUM”) globally amount to $84.9 trillion. The equity proportion of this is 35%. That means that mutual funds, mandates, pension funds and insurance companies own $29.7 trillion of the world’s publicly listed companies. Unfortunately, only 0.4% of global AUM, $360 billion, is managed in funds with environmental, social and governance (“ESG”) criteria integrated in the investment strategy. These are funds with a tilt towards sustainability factors or having specific thematic or geographical coverage focused on exclusions, climate change or diversity. The cumulative growth rate in global AUM is 7.33% annually compared to the growth rate in ESG assets at just 4.66%. The uptake in ESG assets must accelerate faster to accommodate for an effective transition to a low carbon economy. If investors do not reevaluate the current capital flows to companies unwilling or unable to diversify their business models in line with a two degree scenario, investors are in effect expecting returns on assets in companies that eventually must be written off for the planet to be safe. Furthermore, companies that are able to finance costs against their share prices and budgets are built on presumed future returns on those assets. Increasing flows to sustainable business models and restricting flows to unsustainable business models are imperative for the future of this planet — and from an economic perspective as well. In recent years, it has become clear that sustainable investments pay off. One recent report done by Nordea found that the companies with top ESG ratings outperformed laggards by 42% over a 3-year-time period. For calculation purposes, we estimate that the average allocation of equities in an equity fund is defined by the MSCI All Countries World Index (“MSCI ACWI”) containing the universe of both developed and emerging markets. The total market capitalization of the constituents in this index is $50 trillion, and 59% are owned by these fund unit owners. The total emissions from these companies amount to 9.3 gigatonnes of CO2-eq, whereof 4.5 gigatonnes of CO2-eq can be attributed to the fund unit holders. The weighted average carbon intensity of MSCI ACWI is 211.4 CO2-eq per million USD sales, compared to 60.1 CO2-eq per million USD sales for the same index but with a low carbon target. That means that these markets with the low carbon target are 72% less carbon intense. As such, if the capital were reallocated to sustainable alternatives, it can be estimated that a reduction of 96.46 gigatonnes of CO2-eq could be achieved. 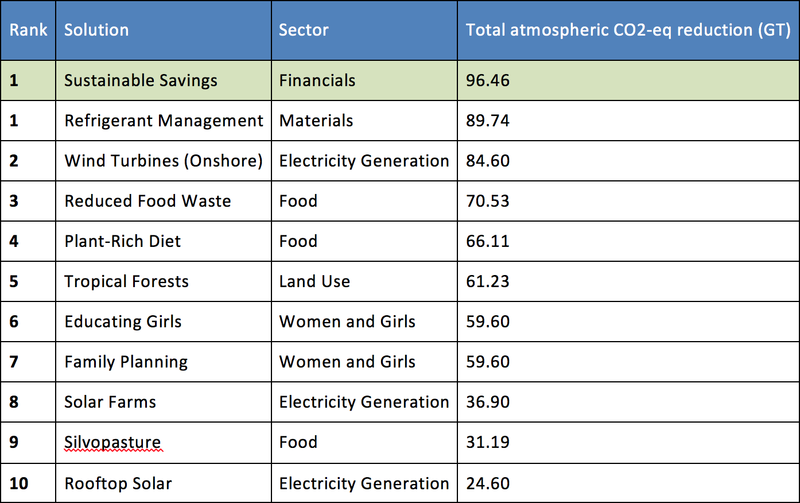 This means that sustainable savings is the number one solution to climate change and the effects are larger than rooftop solar, solar farms, afforestation and electric vehicles combined.